of Merlin" by British Romantic Edward Burne-Jones. the Elder in Left-Bracket First Round Action! A.S. Byatt wrote Possession during the full flowering of postmodernism, whatever that was. Her book reflects that –ism’s frightened fascination with genre, and also its unwillingness to indulge in the art of storytelling without running up flags to show that the author is properly distrustful of Narrative, that naïve and reactionary old beast. Cropper decided to run for it…. “There is no guarantee that that is what we shall find,” said Blackadder. No one ever quite exclaims that they feel like a character in a postmodern novel, but I bet that this was a temptation consciously resisted. Byatt realizes that she is writing within the context(s) of literary tradition(s), and she is bound and determined that you will realize that she realizes it. But that was, or is, the post-modern condition for you. Possession is put together as a collection of texts that cumulatively tell two related tales. The primary and framing story is about a community of literary scholars, some of whom are specialists in the fictional major Victorian poet Randolph Henry Ash and some of whom study the equally fictional but less prominent Christabel LaMotte. As the novel proceeds, they uncover increasingly intriguing evidence of a previously unknown personal connection between their subjects. There is an intense rivalry among the scholars for the new-found documents, for access to the knowledge they reveal, and for the right to control interpretation of the new evidence. At the same time, they are all forced to reinterpret not only the lives and work of their literary heroes, but also their own careers and beliefs, in the light of the new evidence. The second tale, which is slowly excavated through the progress of the first, is that of the relationship between Ash and LaMotte. This is much the simpler story, but it is not without its surprises. The “pastiche” (to use the approved postmodern term) of texts that carry this tale is anchored by straightforward fictional prose that is more or less of the campus comedy genre. Over this narrative bedrock is layered “simulacra” (to use the approved postmodern term) of historical letters, diaries and journals, academic papers (with and without footnotes! ), biography, Victorian poetry, and Victorian prose. Byatt is a fine mimic, and constructs a quite believable pair of Victorian intellectuals who might conceivably still be studied today, complete with extensive samples of their work, correspondence, and critical legacy. Of course, this means that considerable lengths of the book are written in forms that are rather challenging to most readers of today – Victorian poetry, anyone? – and this is a significant downside to Possession’s stylistic veracity. Keeping a story moving forward indirectly by leading the reader through invented primary sources is such a neat trick that it feels curmudgeonly to complain. But there are two problems. The first is a long passage – a chapter, I suppose – found about midway through the book, in which actions of Ash and LaMotte are suddenly and rather jarringly described in direct third-person. I found this lapse into everyday prose unfortunate, because the certainty invoked by direct narrative undermined the sense of mystery and doubt that had been generated by looking at the characters only through indirect documentary evidence. This may have been an authorial blunder. Or, the intention may have been to subvert genre expectations – to deliberately violate an unwritten rule against letting us know more about the object of a quest than the questing characters know themselves (or perhaps the rule is against changing course on this point in mid-novel). In whichever case, I felt the effect was to show why that convention is actually a pretty good idea. Secondly, the richness of the novel’s interwoven texts is made possible only by a constant stream of new historical material being encountered by the present-day characters. This helps make the novel work structurally, but the sheer volume of new discoveries is eventually a bit over the top. At one point, just as the evidence on hand has proven inadequate to fully unraveling the mysteries of the past, a random graduate student in France happens to find some outrageously relevant material in an old diary, and capriciously decides to send it to one of the central characters, and so the chase continues. Well, when a writer calls his work a Romance, it need hardly be observed that he wishes to claim a certain latitude. In several ways, Possession is a masterpiece. In the mimesis of Victorian forms, and in the creative forgery and sequential arrangement of documents in such a way that they gradually reveal two separate story lines, both at comfortable paces, it is a wonderfully constructed novel. The ending, although I made fun of it earlier, is actually rather satisfying, and there is an epilogue that I found both clever and moving. And yet. During the course of my reading, I twice talked to people who had read Possession within the last year or so. They asked me what I thought of it, of course, and the answer I found myself giving was “I like everything about it, except it.” I was surprised that in both cases I was immediately understood and agreed with. 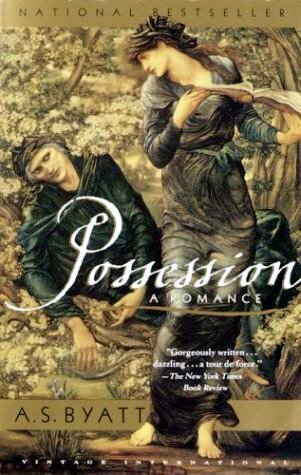 Possession develops a great idea, and it is beautifully structured and expertly written, but it lacked some mysterious ingredient that would take it from the realm of the technically expert into the top tier of truly excellent novels. It was a slow read for me, not because it was difficult to read but because it did not consistently hold my attention. I could put it down without much regret, and often felt no particular hurry to pick it back up again. Self-conscious postmodernist cleverness in art usually makes me yawn. Yeah, I get it...yawn. That was a more accurate and evenhanded review than I could have summoned. I read it in high school, when I'm not sure I'd even heard of postmodernism, but appreciated it on that level nonetheless. Also on the emotionally satisfying level, which surprised me. It seemed indulgent to offer even that kind of a happy ending.